Online gaming is what almost everyone with a smartphone does. It is the practice of playing video games which are primarily or atleast partly played with the help of an internet connection or some other kind of computer network. Gaming being the favourite activity to do during leisure, or we can say, a hobby to many, has hugely created a vast stage to exhibit Graphic innovations, computer science knowledge, programming, art, animation, interactive media, mathematics, multimedia design, physics, and so on.. It therefore also creates a huge Online Gaming Market for you, to steal some share of, as most of the people using internet, do indulge in playing some or the other online games. As a First step towards Online Gaming Marketing Strategy, get to the social media, say create a Facebook page for your product, a YouTube channel, create a blog, a Twitter account and what not.. Use social media platforms to stream your ideas. But what if you are not that social of person? Well, it is the time to be one! Or else, how will anyone get to know about your product?? It is another vital factor to your Online Gaming Marketing Strategies. An appealing logo attracts people towards the brand of your Game. A good logo should be easy enough to be recognised on one hand, yet unique enough to keep people engaged for somewhat good minutes to recognise it. Also, try to use attractive colours while you design the logo for your game. Yes! It is important to develop your own website as a part of your Online Gaming Marketing Strategies. After being present on Facebook, Twitter, YouTube, blog, you should get a website of yours. It will help link all of your social media accounts at a single place and it will provide a place to check regular updates to keep your audience busy. 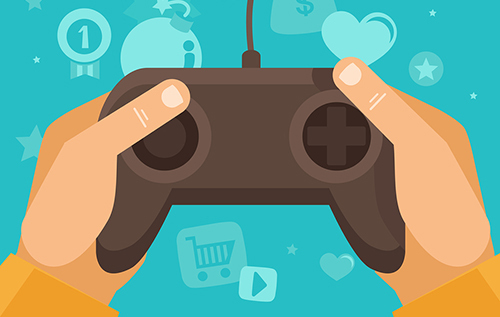 As a part of Online Gaming Marketing Strategies, it is one of the most important point to keep your audience engaged. Keep posting every thing related to your game to increase the thirst of gamers for your product. Higher the number of posts of your content, higher will be the talks about it, all around. It is another important ingredient to your Online Gaming Marketing Strategies. Prepare a list of contacts to help you out with the press release of your game in the marketplace. It is an indespensably Important step towards your Online Gaming Marketing Strategies. Do you stay satisfied with your mobile phone for long? It may keep you pacified for say 3 months or 6 months may be, or a year.. but you do get bored after that, when you get to see new features of other new mobile phones. It is natural human behaviour to get bored of old things and get readily attracted to the new ones. So it is vitally important to be dynamic and keep on evolving regularly, from time to time, in order to keep your market share secured. Hence, keep updating your game, without letting stagnancy in. Let it evolve to keep the interest of gamers alive in your product and sustain in the marketplace. The Online Gaming Market will continue growing tremendously in the future. The availability of infrastructure primarily drives the growth of gaming. Due to shooting demand for online games, developed are focusing on delivering graphic oriented games to provide a better gaming experience. So why not take advantage of this opportunity to get some share of your own.